A new program launched by China Association of Poverty Alleviation and Development (CAPAD) will help subsidize the medical costs of people suffering from tumors, liver diseases and diabetes, allowing them to receive payments ranging from 1,000 yuan ($160.4) to 50,000 yuan. The new medical aid pro¬gram will target self-employed businesspeople, employees of small- and medium-sized enterprises and migrant workers, the Xinhua News Agency reported. The head of the program, Shen Laihao, said that the program aims to help alleviate the heavy burden of medical expenses and difficulty in receiving medical treatment. 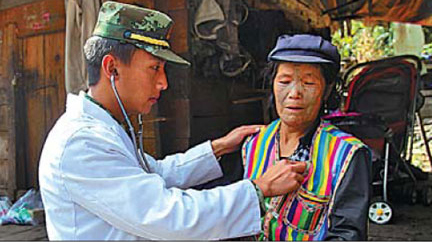 The program has more than 200 designated hospitals, including top level hospitals with specialized technologies, and hospitals of the People's Liberation Army and the People's Armed Police Force. Shen said patients who receive financial aid from the program can also enjoy the benefits of the new rural cooperative medical system and medical insurance. Patients can apply for the program for a subsidy by calling a hotline or logging onto the program's website.